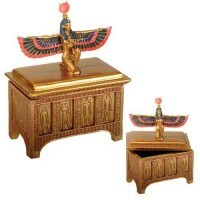 Uniquely shaped small trinket or jewelry box in the Egyptian Revival style of the 1920s with lift off lid. 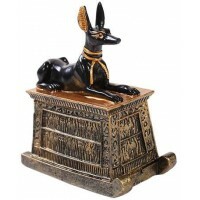 Egyptian Revival was a period of the 1920s when everyone was obsessed with Ancient Egypt and melded art deco with Egyptian Art. 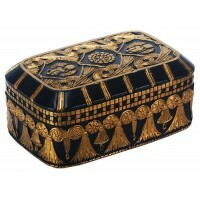 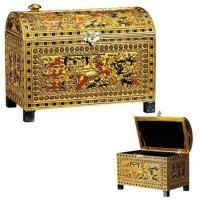 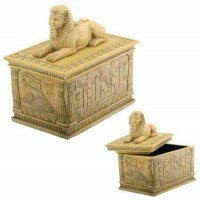 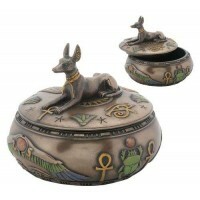 In black cold cast resin with hand painted gold detail, it has Egyptian motifs on all sides of this tapered, art deco shaped box. 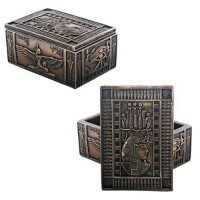 3 1/2 inches. 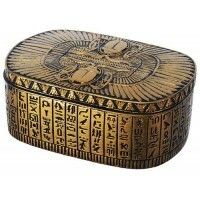 Item Number: PT-10566 | Approximate Size (Inches): 3.50 wide x 3.50 deep x 3.50 high | Approximate Shipping Weight: 1.00 lbs.